Publius Aelius Hadrianus (as emperor Imperator Caesar Divi Traiani filius Traianus Hadrianus Augustus, and Divus Hadrianus after his apotheosis, known as Hadrian in English; 24 January 76 – 10 July 138) was emperor of Rome from AD 117 to 138, as well as a Stoic and Epicurean philosopher. A member of the gens Aelia, Hadrian was the third of the so-called Five Good Emperors. Hadrian was born Publius Aelius Hadrianus in Italica or, less probably, in Rome , from a well-established family which had originated in Picenum in Italy and had subsequently settled in Italica , Hispania Baetica (the republican Hispania Ulterior), near the present day location of Seville, Spain. His predecessor Trajan was a maternal cousin of Hadrian's father. Trajan never officially designated a successor, but, according to his wife, Pompeia Plotina, Trajan named Hadrian emperor immediately before his death. Trajan's wife was well-disposed toward Hadrian: Hadrian may well have owed his succession to her. Hadrian's presumed indebtedness to Plotina was widely regarded as the reason for Hadrian's succession. However, there is evidence that he accomplished his succession on his own governing and leadership merits while Trajan was still alive. For example, between the years AD 100–108 Trajan gave several public examples of his personal favour towards Hadrian, such as betrothing him to his grandniece, Vibia Sabina, designating him quaestor Imperatoris, comes Augusti, giving him Nerva's diamond "as hope of succession", proposing him for consul suffectus, and other gifts and distinctions. The young Hadrian was Trajan's only direct male family/marriage/bloodline. The support of Plotina and of L. Licinius Sura (died in AD 108) were nonetheless extremely important for Hadrian, already in this early epoch. Although it was an accepted part of Hadrian's personal history that Hadrian was born in Italica located in the province called Hispania Baetica (the southernmost Roman province in the Iberian Peninsula , comprising modern Spain and Portugal ), his biography in Augustan History states that he was born in Rome on 24 January 76 of a family originally Italian, but Hispanian for many generations. However, this may be a ruse to make Hadrian look like a person from Rome instead of a person hailing from the provinces. His father was the Hispano-Roman Publius Aelius Hadrianus Afer, who as a senator of praetorian rank would spend much of his time in Rome. Hadrian’s forefathers came from Hadria, modern Atri , an ancient town of Picenum in Italy, but the family had settled in Italica in Hispania Baetica soon after its founding by Scipio Africanus.Afer was a paternal cousin of the future Emperor Trajan. 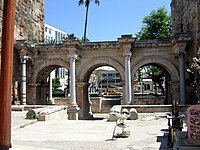 His mother was Domitia Paulina who came from Gades (Cádiz ). Paulina was a daughter of a distinguished Hispano-Roman Senatorial family. Hadrian’s elder sister and only sibling was Aelia Domitia Paulina, married with the triple consul Lucius Julius Ursus Servianus, his niece was Julia Serviana Paulina and his great-nephew was Gnaeus Pedanius Fuscus Salinator, from Barcino. His parents died in 86 when Hadrian was ten, and the boy then became a ward of both Trajan and Publius Acilius Attianus (who was later Trajan’s Praetorian Prefect). Hadrian was schooled in various subjects particular to young aristocrat of the day, and was so fond of learning Greek literature that he was nicknamed Graeculus ("Greekling"). Hadrian visited Italica when (or never left it until) he was 14, when he was recalled by Trajan who thereafter looked after his development. He never returned to Italica although it was later made a colonia in his honour. His first military service was as a tribune of the Legio II Adiutrix. Later, he was to be transferred to the Legio I Minervia in Germany . When Nerva died in 98, Hadrian rushed to inform Trajan personally. He later became legate of a legion in Upper Pannonia and eventually governor of said province. He was also archon in Athens for a brief time, and was elected an Athenian citizen. His career before becoming emperor follows:decemvir stlitibus iudicandis -sevir turmae equitum Romanorum -praefectus Urbi feriarum Latinarum -tribunus militum legionis II Adiutricis Piae Fidelis (95, in Pannonia Inferior) -tribunus militum legionis V Macedonicae (96, in Moesia Inferior) -tribunus militum legionis XXII Primigeniae Piae Fidelis (97, in Germania Superior) -quaestor (101) -ab actis senatus -tribunus plebis (105) -praetor (106) -legatus legionis I Minerviae Piae Fidelis (106, in Germania Inferior) -legatus Augusti pro praetore Pannoniae Inferioris (107) -consul suffectus (108) -septemvir epulonum (before 112) -sodalis Augustalis (before 112) -archon Athenis (112/13) -legatus Syriae (117). Hadrian was active in the wars against the Dacians (as legate of the V Macedonica) and reputedly won awards from Trajan for his successes. Due to an absence of military action in his reign, Hadrian's military skill is not well attested; however, his keen interest and knowledge of the army and his demonstrated skill of administration show possible strategic talent. Hadrian joined Trajan's expedition against Parthia as a legate on Trajan’s staff. Neither during the initial victorious phase, nor during the second phase of the war when rebellion swept Mesopotamia did Hadrian do anything of note. However when the governor of Syria had to be sent to sort out renewed troubles in Dacia, Hadrian was appointed as a replacement, giving him an independent command. Trajan, seriously ill by that time, decided to return to Rome while Hadrian remained in Syria to guard the Roman rear. Trajan only got as far as Selinus before he became too ill to go further. While Hadrian may have been the obvious choice as successor, he had never been adopted as Trajan's heir. As Trajan lay dying, nursed by his wife, Plotina (a supporter of Hadrian), he at last adopted Hadrian as heir. Since the document was signed by Plotina, it has been suggested that Trajan may have already been dead. Hadrian quickly secured the support of the legions — one potential opponent, Lusius Quietus, was instantly dismissed. The Senate's endorsement followed when possibly falsified papers of adoption from Trajan were presented (although he had been the ward of Trajan). The rumour of a falsified document of adoption carried little weight — Hadrian's legitimacy arose from the endorsement of the Senate and the Syrian armies. Marble statue of Hadrian (Istanbul Archeological Museum). Hadrian did not at first go to Rome — he was busy sorting out the East and suppressing the Jewish revolt that had broken out under Trajan, then moving on to sort out the Danube frontier. Instead, Attianus, Hadrian's former guardian, was put in charge in Rome. There he "discovered" a plot involving four leading Senators including Lusius Quietus and demanded of the Senate their deaths. There was no question of a trial — they were hunted down and killed out of hand. Because Hadrian was not in Rome at the time, he was able to claim that Attianus had acted on his own initiative. According to Elizabeth Speller the real reason for their deaths was that they were Trajan's men. Despite his own great stature as a military administrator, Hadrian's reign was marked by a general lack of major military conflicts, apart from the Second Roman-Jewish War. He surrendered Trajan's conquests in Mesopotamia, considering them to be indefensible. There was almost a war with Parthia around 121, but the threat was averted when Hadrian succeeded in negotiating a peace. The peace policy was strengthened by the erection of permanent fortifications along the empire's borders (limites, sl. limes). The most famous of these is the massive Hadrian's Wall in Great Britain , and the Danube and Rhine borders were strengthened with a series of mostly wooden fortifications, forts, outposts and watchtowers, the latter specifically improving communications and local area security. To maintain morale and keep the troops from getting restive, Hadrian established intensive drill routines, and personally inspected the armies. Although his coins showed military images almost as often as peaceful ones, Hadrian's policy was peace through strength, even threat. Hadrian has been described, by Ronald Syme among others, as the most versatile of all the Roman Emperors. He also liked to display a knowledge of all intellectual and artistic fields. Above all, Hadrian patronized the arts: Hadrian's Villa at Tibur (Tivoli ) was the greatest Roman example of an Alexandrian garden, recreating a sacred landscape, lost in large part to the despoliation of the ruins by the Cardinal d'Este who had much of the marble removed to build Villa d'Este . 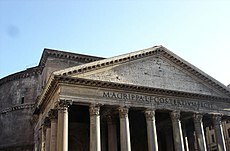 In Rome , the Pantheon , originally built by Agrippa but destroyed by fire in 80, was rebuilt under Hadrian in the domed form it retains to this day. It is among the best preserved of Rome's ancient buildings and was highly influential to many of the great architects of the Italian Renaissance and Baroque periods. From well before his reign, Hadrian displayed a keen interest in architecture, but it seems that his eagerness was not always well received. For example, Apollodorus of Damascus, famed architect of the Forum of Trajan , dismissed his designs. When Trajan, predecessor to Hadrian, consulted Apollodorus about an architectural problem, Hadrian interrupted to give advice, to which Apollodorus replied, "Go away and draw your pumpkins. You know nothing about these problems." "Pumpkins" refers to Hadrian's drawings of domes like the Serapeum in his Villa. It is rumoured that once Hadrian succeeded Trajan to become emperor, he had Apollodorus exiled and later put to death. It is very possible that this later story was a later attempt to defame his character, as Hadrian, though popular among a great many across the empire, was not universally admired, either in his lifetime or afterward. Hadrian wrote poetry in both Latin and Greek; one of the few surviving examples is a Latin poem he reportedly composed on his deathbed (see below). He also wrote an autobiography – not, apparently, a work of great length or revelation, but designed to scotch various rumours or explain his various actions. The work is lost but was apparently used by the writer — whether Marius Maximus or someone else – on whom the Historia Augusta principally relied for its vita of Hadrian: at least, a number of statements in the vita have been identified (by Ronald Syme and others) as probably ultimately stemming from the autobiography. Hadrian was a passionate hunter, already from the time of his youth according to one source. In northwest Asia, he founded and dedicated a city to commemorate a she-bear he killed. It is documented that in Egypt he and his beloved Antinous killed a lion. In Rome, eight reliefs featuring Hadrian in different stages of hunting decorate a building that began as a monument celebrating a kill. Another of Hadrian's contributions to "popular" culture was the beard, which symbolised his philhellenism. Except for Nero (also a great lover of Greek culture), all Roman emperors before Hadrian were clean shaven. Most of the emperors after Hadrian would be portrayed with beards. Their beards, however, were not worn out of an appreciation for Greek culture but because the beard had, thanks to Hadrian, become fashionable. Hadrian had a face covered in warts and scars, and this may have partially motivated Hadrian's beard growth. Hadrian was a humanist and deeply Hellenophile in all his tastes. He favoured the doctrines of the philosophers Epictetus, Heliodorus and Favorinus, but was generally considered an Epicurean, as were some of his friends such as Caius Bruttius Praesens. At home he attended to social needs. Hadrian mitigated but did not abolish slavery, had the legal code humanized and forbade torture. He built libraries, aqueducts, baths and theaters. Hadrian is considered by many historians to have been wise and just: Schiller called him "the Empire's first servant", and British historian Edward Gibbon admired his "vast and active genius", as well as his "equity and moderation". In 1776, he stated that Hadrian's epoch was part of the "happiest era of human history". While visiting Greece in 126, Hadrian attempted to create a kind of provincial parliament to bind all the semi-autonomous former city states across all Greece and Ionia (in Asia Minor ). This parliament, known as the Panhellenion, failed despite spirited efforts to instill cooperation among the Hellenes. Hadrian had a close relationship, widely reported to have been romantic, with a Greek youth, Antinous, whom he met in Bithynia in 124 when the boy was thirteen or fourteen. While touring Egypt in 130, Antinous mysteriously drowned in the Nile. Deeply saddened, Hadrian founded the Egyptian city of Antinopolis , and had Antinous deified - an unprecedented honour for one not of the ruling family. Hadrian died at his villa in Baiae . He was buried in a mausoleum on the western bank of the Tiber, in Rome , a building later transformed into a papal fortress, Castel Sant'Angelo . The dimensions of his mausoleum, in its original form, were deliberately designed to be slightly larger than the earlier Mausoleum of Augustus . According to Cassius Dio a gigantic equestrian statue was erected to Hadrian after his death. "It was so large that the bulkiest man could walk through the eye of each horse, yet because of the extreme height of the foundation persons passing along on the ground below believe that the horses themselves as well as Hadrian are very small." The Stoic-Epicurean Emperor traveled broadly, inspecting and correcting the legions in the field. Even prior to becoming emperor, he had traveled abroad with the Roman military, giving him much experience in the matter. More than half his reign was spent outside of Italy. Other emperors often left Rome to simply go to war, returning soon after conflicts concluded. A previous emperor, Nero, once traveled through Greece and was condemned for his self indulgence. Hadrian, by contrast, traveled as a fundamental part of his governing, and made this clear to the Roman senate and the people. He was able to do this because at Rome he possessed a loyal supporter within the upper echelons of Roman society, a military veteran by the name of Marcius Turbo. Also, there are hints within certain sources that he also employed a secret police force, the frumentarii, to exert control and influence in case anything should go wrong while he journeyed abroad. Hadrian's visits were marked by handouts which often contained instructions for the construction of new public buildings. Hadrian was willful of strengthening the Empire from within through improved infrastructure, as opposed to conquering or annexing perceived enemies. This was often the purpose of his journeys; commissioning new structures, projects and settlements. His almost evangelical belief in Greek culture strengthened his views: like many emperors before him, Hadrian's will was almost always obeyed. His traveling court was large, including administrators and likely architects and builder. The burden on the areas he passed through were sometimes great. While his arrival usually brought some benefits it is possible that those who had to carry the burden were of different class to those who reaped the benefits. For example, huge amounts of provisions were requisitioned during his visit to Egypt , this suggests that the burden on the mainly subsistence farmers must have been intolerable, causing some measure of starvation and hardship. At the same time, as in later times all the way through the European Renaissance, kings were welcomed into their cities or lands, and the financial burden was completely on them, and only indirectly on the poorer class. Hadrian's first tour came in 121 and was initially aimed at covering his back to allow himself the freedom to concern himself with his general cultural aims. He traveled north, towards Germania and inspected the Rhine-Danube frontier, allocating funds to improve the defences. However it was a voyage to the Empire's very frontiers that represented his perhaps most significant visit; upon hearing of a recent revolt, he journeyed to Britannia. Prior to Hadrian's arrival on Great Britain there had been a major rebellion in Britannia, spanning roughly two years (119–121). It was here where in 122 he initiated the building of Hadrian's Wall (the exact Latin name of which is unknown). The purpose of the wall is academically debated. In 1893, Haverfield stated categorically that the Wall was a means of military defence. This prevailing, early 20th century view was challenged by Collingwood in 1922. Since then, other points of view have been put forwards; the wall has been seen as a marker to the limits of Romanitas, as a monument to Hadrian to gain glory in lieu of military campaigns, as work to keep the Army busy and prevent mutiny and waste through boredom, or to safeguard the frontier province of Britannia, by preventing future small scale invasions and unwanted immigration from the northern country of Caledonia (now modern day Scotland ). Caledonia was inhabited by tribes known to the Romans as Caledonians. Hadrian realized that the Caledonians would refuse to cohabitate with the Romans. He also was aware that although Caledonia was valuable, the harsh terrain and highlands made its conquest costly and unprofitable for the Empire at large. Thus, he decided instead on building a wall. Unlike the Germanic limes, built of wood palisades, the lack of suitable wood in the area required a stone construction; nevertheless, the Western third of the wall, from modern-day Carlisle to the River Irthing, was built of turf because of the lack of suitable building stone. This problem also led to the narrowing of the width of the wall, from the original 12 feet to 7, saving masonry. Hadrian is perhaps most famous for the construction of this wall whose ruins still span many miles and to date bear his name. In many ways it represents Hadrian's will to improve and develop within the Empire, rather than waging wars and conquering. Under him, a shrine was erected in York to Britain as a Goddess, and coins were struck which introduced a female figure as the personification of Britain, labeled BRITANNIA. By the end of 122 he had concluded his visit to Britannia, and from there headed south by sea to Mauretania. In 123, he arrived in Mauretania where he personally led a campaign against local rebels. However this visit was to be short, as reports came through that the Eastern nation of Parthia was again preparing for war, as a result Hadrian quickly headed eastwards. On his journey east it is known that at some point he visited Cyrene during which he personally made available funds for the training of the young men of well bred families for the Roman military. This might well have been a stop off during his journey East. Cyrene had already benefited from his generosity when he in 119 had provided funds for the rebuilding of public buildings destroyed in the recent Jewish revolt. When Hadrian arrived on the Euphrates, he characteristically solved the problem through a negotiated settlement with the Parthian king Osroes I. He then proceeded to check the Roman defences before setting off West along the coast of the Black Sea . He probably spent the winter in Nicomedia , the main city of Bithynia. As Nicomedia had been hit by an earthquake only shortly prior to his stay, Hadrian was generous in providing funds for rebuilding. Thanks to his generosity he was acclaimed as the chief restorer of the province as a whole. It is more than possible that Hadrian visited Claudiopolis and there espied the beautiful Antinous, a young boy who was destined to become the emperor's beloved. Sources say nothing about when Hadrian met Antinous, however, there are depictions of Antinous that shows him as a young man of 20 or so. As this was shortly before Antinous's drowning in 130 Antinous would more likely have been a youth of 13 or 14. It is possible that Antinous may have been sent to Rome to be trained as page to serve the emperor and only gradually did he rise to the status of imperial favourite. After meeting Antinous, Hadrian traveled through Anatolia . The route he took is uncertain. Various incidents are described such as his founding of a city within Mysia, Hadrianutherae, after a successful boar hunt. (The building of the city was probably more than a mere whim — lowly populated wooded areas such as the location of the new city were already ripe for development). Some historians dispute whether Hadrian did in fact commission the city's construction at all. At about this time, plans to build a temple in Asia Minor were written up. The new temple would be dedicated to Trajan and Hadrian and built with dazzling white marble. The climax of this tour was the destination that the hellenophile Hadrian must all along have had in mind, Greece. He arrived in the autumn of 124 in time to participate in the Eleusinian Mysteries. By tradition at one stage in the ceremony the initiates were supposed to carry arms but this was waived to avoid any risk to the emperor among them. At the Athenians' request he conducted a revision of their constitution — among other things a new phyle (tribe) was added bearing his name. During the winter he toured the Peloponnese . His exact route is uncertain, however Pausanias reports of tell-tale signs, such as temples built by Hadrian and the statue of the emperor built by the grateful citizens of Epidaurus in thanks to their "restorer". He was especially generous to Mantinea which supports the theory that Antinous was in fact already Hadrian's lover because of the strong link between Mantinea and Antinous's home in Bithynia. By March 125, Hadrian had reached Athens presiding over the festival of Dionysia. The building program that Hadrian initiated was substantial. Various rulers had done work on building the Temple of Olympian Zeus — it was Hadrian who ensured that the job would be finished. He also initiated the construction of several public buildings on his own whim and even organized the building of an aqueduct. On his return to Italy, Hadrian made a detour to Sicily. Coins celebrate him as the restorer of the island though there is no record of what he did to earn this accolade. Back in Rome he was able to see for himself the completed work of rebuilding the Pantheon . Also completed by then was Hadrian's villa nearby at Tibur a pleasant retreat by the Sabine Hills for whenever Rome became too much for him. At the beginning of March 127 Hadrian set off for a tour of Italy. Once again, historians are able to reconstruct his route by evidence of his hand-outs rather than the historical records. For instance, in that year he restored the Picentine earth goddess Cupra in the town of Cupra Maritima. At some unspecified time he improved the drainage of the Fucine lake . Less welcome than such largesse was his decision to divide Italy into 4 regions under imperial legates with consular rank. Being effectively reduced to the status of mere provinces did not go down well and this innovation did not long outlive Hadrian. Hadrian fell ill around this time, though the nature of his sickness is not known. Whatever the illness was, it did not stop him from setting off in the spring of 128 to visit Africa. His arrival began with the good omen of rain ending a drought. Along with his usual role as benefactor and restorer he found time to inspect the troops and his speech to the troops survives to this day. Hadrian returned to Italy in the summer of 128 but his stay was brief before setting off on another tour that would last three years. In September 128 Hadrian again attended the Eleusinian mysteries. This time his visit to Greece seems to have concentrated on Athens and Sparta — the two ancient rivals for dominance of Greece. Hadrian had played with the idea of focusing his Greek revival round Amphictyonic League based in Delphi but he by now had decided on something far grander. His new Panhellenion was going to be a council that would bring together Greek cities wherever they might be found. The meeting place was to be the new temple to Zeus in Athens. Having set in motion the preparations — deciding whose claim to be a Greek city was genuine would in itself take time — Hadrian set off for Ephesus . In October 130, while Hadrian and his entourage were sailing on the Nile, Antinous drowned, for unknown reasons, though accident, suicide, murder or religious sacrifice have all been postulated. The emperor was grief stricken. He ordered Antinous deified, and cities were named after the boy, medals struck with his effigy, and statues erected to him in all parts of the empire. Temples were built for his worship in Bithynia, Mantineia in Arcadia, and Athens, festivals celebrated in his honour and oracles delivered in his name. The city of Antinopolis or Antinoe was founded on the ruins of Besa where he died (Cassius Dio, LIX.11; Historia Augusta, Hadrian). Hadrian’s movements subsequent to the founding of Antinopolis on October 30, 130 are obscure. Whether or not he returned to Rome, he spent the winter of 131–32 in Athens and probably remained in Greece or further East because of the Jewish rebellion which broke out in Judaea in 132 (see below). Inscriptions make it clear that he took the field in person against the rebels with his army in 133; he then returned to Rome, probably in that year and almost certainly (judging again from inscriptions) via Illyricum. In 130, Hadrian visited the ruins of Jerusalem , in Judaea, left after the First Roman-Jewish War of 66–73. He rebuilt the city, renaming it Aelia Capitolina after himself and Jupiter Capitolinus, the chief Roman deity. A new temple dedicated to the worship of Jupiter was built on the ruins of the old Jewish Second Temple, which had been destroyed in 70. In addition, Hadrian abolished circumcision, which was considered by Romans and Greeks as a form of bodily mutilation and hence "barbaric". These anti-Jewish policies of Hadrian triggered in Judaea a massive Jewish uprising, led by Simon bar Kokhba and Akiba ben Joseph. Following the outbreak of the revolt, Hadrian called his general Sextus Julius Severus from Britain, and troops were brought from as far as the Danube. Roman losses were very heavy, and it is believed that an entire legion, the XXII Deiotariana was destroyed. Indeed, Roman losses were so heavy that Hadrian's report to the Roman Senate omitted the customary salutation "I and the legions are well". However, Hadrian's army eventually put down the rebellion in 135, after three years of fighting. According to Cassius Dio, during the war 580,000 Jews were killed, 50 fortified towns and 985 villages razed. The final battle took place in Beitar, a fortified city 10 km. southwest of Jerusalem. The city only fell after a lengthy siege, and Hadrian only allowed the Jews to bury their dead after a period of six days. According to the Babylonian Talmud, after the war Hadrian continued the persecution of Jews. He attempted to root out Judaism, which he saw as the cause of continuous rebellions, prohibited the Torah law, the Hebrew calendar and executed Judaic scholars (see Ten Martyrs). The sacred scroll was ceremonially burned on the Temple Mount . In an attempt to erase the memory of Judaea, he renamed the province Syria Palaestina (after the Philistines), and Jews were forbidden from entering its rededicated capital. When Jewish sources mention Hadrian it is always with the epitaph "may his bones be crushed" (שחיק עצמות or שחיק טמיא, the Aramaic equivalent), an expression never used even with respect to Vespasian or Titus who destroyed the Second Temple. [[Image:Adriano5.jpg|thumb|right|100px|Bust of Hadrian, National Archaeological Museum of Athens]]Hadrian spent the final years of his life at Rome. In 134, he took an Imperial salutation or the end of the Second Jewish War (which was not actually concluded until the following year). In 136, he dedicated a new Temple of Venus and Roma on the former site of Nero's Golden House . About this time, suffering from poor health, he turned to the problem of the succession. In 136 he adopted one of the ordinary consuls of that year, Lucius Ceionius Commodus, who took the name Lucius Aelius Caesar. He was both the stepson and son-in-law of Gaius Avidius Nigrinus, one of the "four consulars" executed in 118, but was himself in delicate health. Granted tribunician power and the governorship of Pannonia, Aelius Caesar held a further consulship in 137, but died on January 1, 138. Following the death of Aelius Caesar, Hadrian next adopted Titus Aurelius Fulvus Boionius Arrius Antoninus (the future emperor Antoninus Pius), who had served as one of the four imperial legates of Italy (a post created by Hadrian) and as proconsul of Asia. On 25 February 138 Antoninus received tribunician power and imperium. Moreover, to ensure the future of the dynasty, Hadrian required Antoninus to adopt both Lucius Ceionius Commodus (son of the deceased Aelius Caesar) and Marcus Annius Verus (who was the grandson of an influential senator of the same name who had been Hadrian’s close friend; Annius was already betrothed to Aelius Caesar’s daughter Ceionia Fabia). Hadrian’s precise intentions in this arrangement are debatable. Though the consensus is that he wanted Annius Verus (who would later become the Emperor Marcus Aurelius) to succeed Antoninus, it has also been argued that he actually intended Ceionius Commodus, the son of his own adopted son, to succeed, but was constrained to show favour simultaneously to Annius Verus because of his strong connections to the Hispano-Narbonensian nexus of senatorial families of which Hadrian himself was a part. It may well not have been Hadrian, but rather Antoninus Pius — who was Annius Verus’s uncle – who advanced the latter to the principal position. The fact that Annius would divorce Ceionia Fabia and re-marry to Antoninus' daughter Annia Faustina points in the same direction. When he eventually became Emperor, Marcus Aurelius would co-opt Ceionius Commodus as his co-Emperor (under the name of Lucius Verus) on his own initiative. The ancient sources present Hadrian's last few years as marked by conflict and unhappiness. The adoption of Aelius Caesar proved unpopular, not least with Hadrian's brother-in-law Lucius Julius Ursus Servianus and Servianus' grandson Gnaeus Pedanius Fuscus Salinator. Servianus, though now far too old, had stood in line of succession at the beginning of the reign; Fuscus is said to have had designs on the imperial power for himself, and in 137 he may have attempted a coup in which his grandfather was implicated. Whatever the truth, Hadrian ordered that both be put to death. Servianus is reported to have prayed before his execution that Hadrian would "long for death but be unable to die". The prayer was fulfilled; as Hadrian suffered from his final, protracted illness, he had to be prevented from suicide on several occasions. Hadrian died in 138 on the tenth day of July, in his villa at Baiae at age 62. The cause of death is believed to have been heart failure. Dio Cassius and the Historia Augusta record details of his failing health, and a study published in 1980 drew attention to classical sculptures of Hadrian that show he had diagonal earlobe creases – a characteristic associated with coronary heart disease. Hadrian was buried first at Puteoli, near Baiae, on an estate which had once belonged to Cicero. Soon after, his remains were transferred to Rome and buried in the Gardens of Domitia, close by the almost-complete mausoleum. Upon the completion of the Tomb of Hadrian in Rome in 139 by his successor Antoninus Pius, his body was cremated, and his ashes were placed there together with those of his wife Vibia Sabina and his first adopted son, Lucius Aelius, who also died in 138. Antoninus also had him deified in 139 and given a temple on the Campus Martius. Alicia M. Canto, "Itálica, patria y ciudad natal de Adriano (31 textos históricos y argumentos contra Vita Hadr. 1, 3", Athenaeum vol. 92.2, 2004, pp. 367–408 . As Canto states, it exists only one ancient quote of Hadrian's birth in Rome (SHA, Vita Hadr 2,4, probably interpolated), opposite to 25 ancient authors who affirm that he was born in Italica. Among these ancient sources is included his own imperial horoscope, which remained in the famous Antigonus of Nicaea's collection (end of the 2nd. century A.D.). This horoscope was well studied by prominent authors as F. H. Cramer, Astrology in Roman Law and Politics, Mem.Amer.Philos.Soc. nr. 37 , Philadelphia, 1954 (repr. 1996), see for Hadrian p. 162–178, fn. 121b and 122, etc. : "...Hadrian -whose horoscope is absolutely certain- surely was born in southern Spain... (in) SHA, Hadrian, 2, 4, the birth was erroneusly assigned to Rome instead of Italica, the actual birth-place of Hadrian...", or O. Neugebauer and H. B. Van Hoesen in their magisterial compilation Greek Horoscopes, Mem.Amer.Philos.Soc. nr. 48, Philadelphia, 1959, nr. L76, see now here, ed. 1987 pp. 80, 90-91 and his footnote 19. They came also to the conclusion that the astronomic parallel of the Hadrian’s birth is situated in the Baetica, today Andalusia: “...L40 agrees exactly with the geographical latitude of southern Spain, the place of origin of Hadrian and his family...”.. "since Hadrian was born in Italica (southern Spain, near Seville, latitude about 37° 30)...". Eutr. VIII. 6: "...nam eum (Hadrianum) Traianus, quamquam consobrinae suae filium..." and SHA, Vita Hadr. I, 2: ...pater Aelius Hadrianus cognomento Afer fuit, consobrinus Traiani imperatoris. After A.M. Canto, in , specifically pp. 322, 328, 341 and footnote 124, where she stands out SHA, Vita Hadr. 1.2: pro filio habitus (years 93); 3.2: ad bellum Dacicum Traianum familiarius prosecutus est (year 101) or, principally, 3.7: quare adamante gemma quam Traianus a Nerva acceperat donatus ad spem successionis erectus est (year 107). But see footnotes 4 and 5. On the numerous senatorial families from Hispania residing at Rome and its vicinity around the time of Hadrian’s birth see R.Syme, 'Spaniards at Tivoli', in Roman Papers IV (Oxford, 1988), pp.96-114. Tivoli (Tibur) was of course the site of Hadrian’s own imperial villa. Royston Lambert, Beloved And God, pp.31–32. The Historia Augusta notes that 'the Britons could not be kept under Roman control; Pompeius Falco was sent to Britain to restore order (Birley 123) and coins of 119-120 refer to this. Breeze and Dobson (2000) pp. 15-17. Ronald Syme, "Journeys of Hadrian" (1988), pp. 164-169. The Aramaic version, "שחיק טמיא", is used, e.g., in Genesis Rabbah 78:1. This is referenced by Rashi in his comment on the phrase, "טמא לנפש", in his commentary on Numbers 5:2. The other two locations in Genesis Rabbah referenced in Rashi's comment, 10:3 and 28:3, use the Hebrew version, "שחיק עצמות"
The adoptions: Anthony Birley, pp. 294-295; T.D. Barnes, 'Hadrian and Lucius Verus', Journal of Roman Studies (1967), Ronald Syme, Tacitus, p. 601. Antoninus as a legate of Italy: Anthony Birley, p. 199. Diagonal Earlobe Creases, Type A Behavior and the Death of Emperor Hadrian ; Nicholas L. Petrakis, MD, West J Med. 1980 January; 132(1): 87–91. Historia Augusta, Hadrian 25.9; Antony Birley, p. 301. Smallwood, E.M., Documents Illustrating the Principates of Nerva Trajan and Hadrian, Cambridge, 1966. "Emperor Hadrian, YouTube hero": a review by Tom Holland of the Hadrian Exhibition at the British Museum, TLS, August 6 2008.